Low-maintenance plants are becoming more and more popular with time, mostly due to the busy life we are living. This is why succulents are one of the most wanted plants at the moment. They are not only easy to care for but are also suitable for growing in containers and are stylish and cool to look at. You can use them in border areas of flower beds, stone and wall beds. We believe that this is just the start of the era of succulents – with the climate changes and busy lifestyle gardener will turn more and more to low-care, drought-tough plants. Knowing all of these facts, you are surely considering to add these little beauties to your home garden. 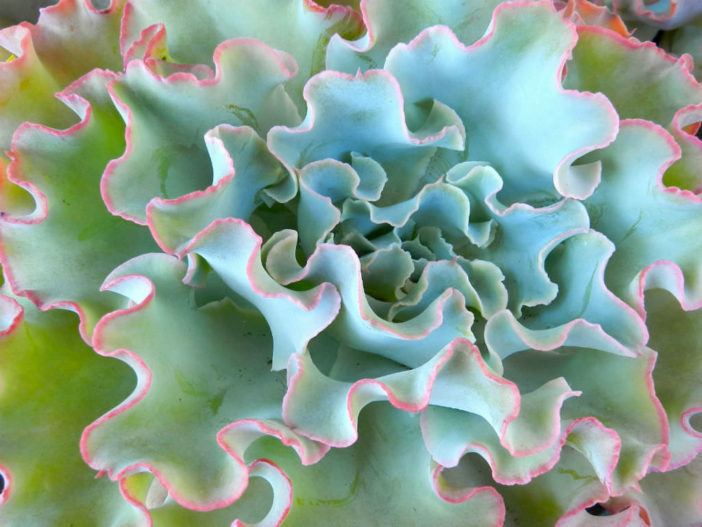 Choose one of these 10 stylish succulents we are suggesting today as they are all low-maintenance, stylish and simply gorgeous. Sedum adolphii or most commonly known as Golden Sedum will make a great addition to your garden. What makes this species special and one of the best to grow in your home or garden is the fact that they change color. They will turn brighter orange when exposed to sun which is why they are perfect to plant along blue and silver colored flowers. The star shaped flowers will add charm to any garden. Not to mention they are low maintenance and drought tolerant. Echeveria elegans or Hen and Chicks is a classic succulent that is most commonly present in almost every home and garden. They grow well indoors and out in both cool or hot temperatures. They got the name because of the rosette shape and their ability to produce plenty of “babies”. 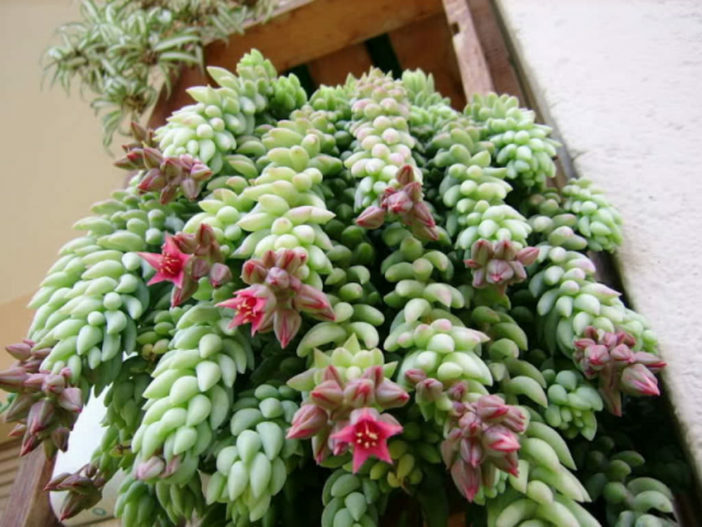 What makes them one of the most popular succulents is also their ability to thrive on any condition, which means that even poor soil and a tiny container is enough to grow them. They don’t need fertilizer and require very little water. Aloe vera, also known as Aloe barbadensis, can be grown both outside and inside. Just make sure you place them in full sun. As with any succulent, watering should be minimal during winter while in summer you should soak the soil then let it dry before watering it again. Because of its shallow roots we recommend choosing a wide pot instead of a deep one when replanting. 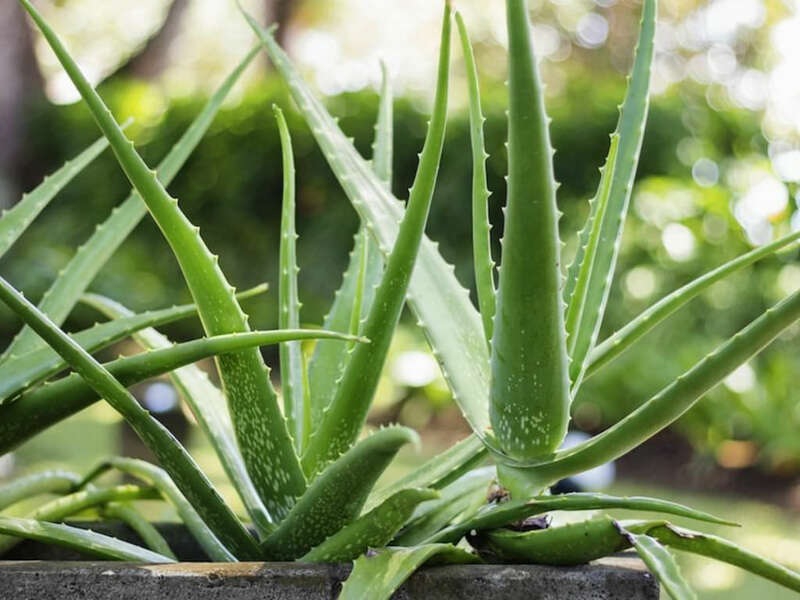 Aloe vera plants are easily propagated. Just remove the offsets which are produced around the base of mature plants when they are a couple inches tall. Sedum morganianum or popularly called Burro’s Tail is a beautiful blue colored delicate succulent. When it blooms tiny little red flowers appear. All you need to know if you want to grow this beautiful succulent is that it needs gritty soil, good drainage, sunshine and protection from extreme cold temperatures. This means you can grow it both indoors and in your garden. Only downfall is its delicacy – the leaves will fall off at the slightest touch. Good thing is that you can use the fallen leaves to propagate new plants. 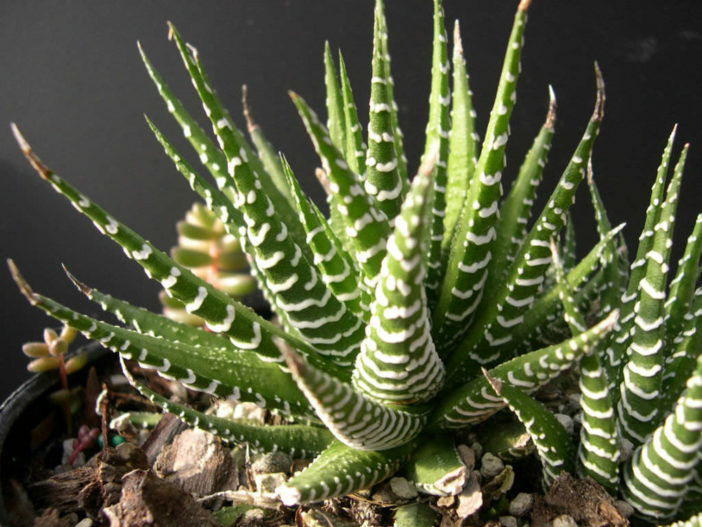 You will easily fall in love with this beautiful succulent. Its beautifully patterned leaves with leathery surface, the small simple white flowers it produces, the fact that it is one of the easiest plants to grow – all these make Haworthiopsis attenuata a favorite plant. This succulent has only two enemies – frost and excess water. If you live in a colder climate keep it inside at least during the winter. 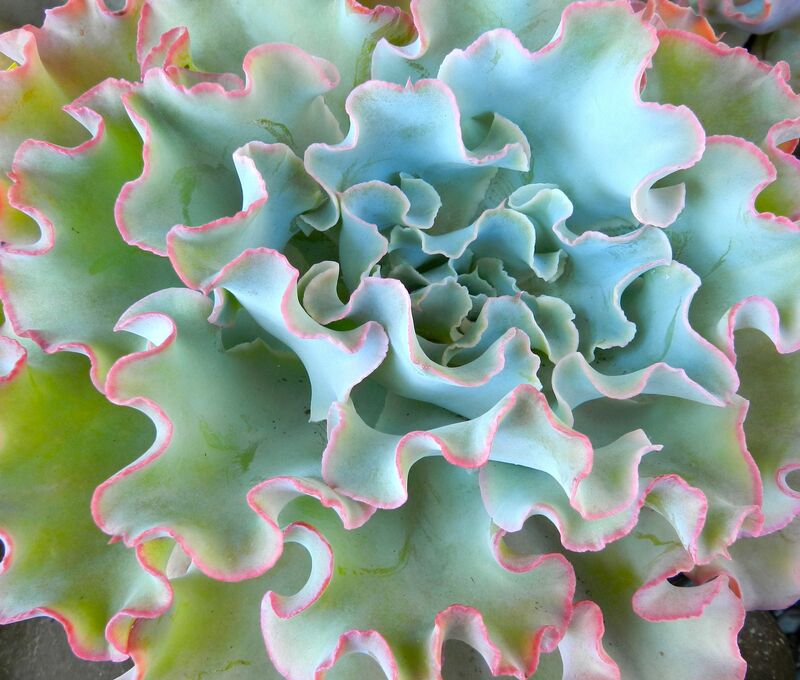 Echeverias are among the most popular succulents and Echeveria ‘Lady Aquarius’ is surely the favorite among them. It looks like a ruffly underwater sea anemone forming loose, up to 8 inches (20 cm) rosette. You can grow this beautiful succulent even if you are a beginner gardener as it is tough and resilient. To keep your plant happy and healthy place it in full sun and provide good drainage. 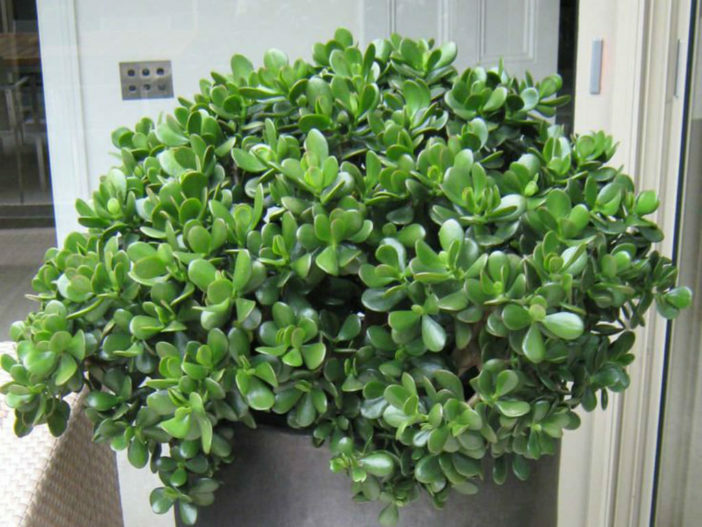 Crassula ovata or commonly known as Jade Plant or Jade Tree is one of the most popular succulents, especially as a house plant. Just like any other succulent they prefer strong light and a well-draining soil. They can tolerate low light and require very little watering. It is very easy to propagate them by simply rooting a cutting of the stem or leaves. 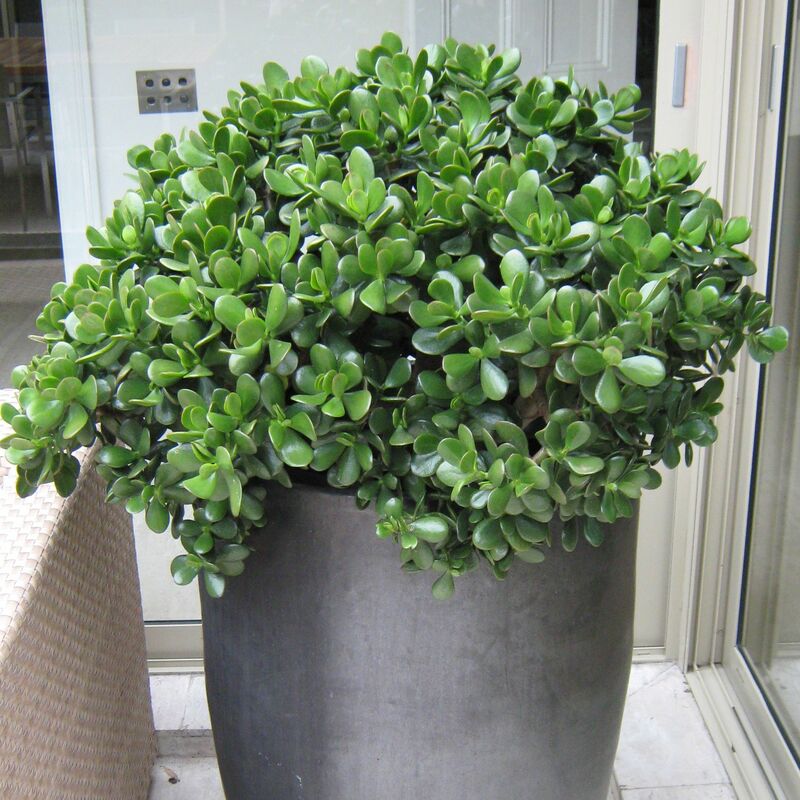 Jade Plants’ leaves are rubbery to the touch and quite flexible. If grown in strong light they will get a beautiful red margin. 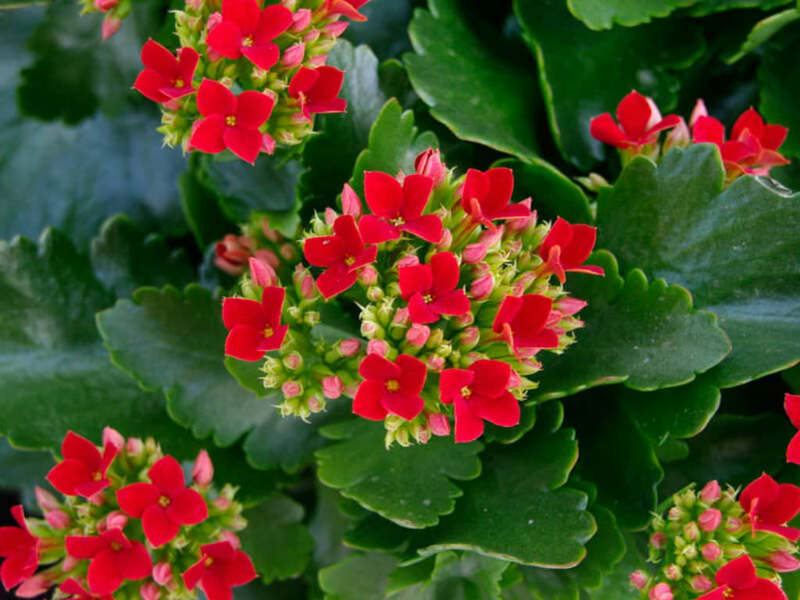 Kalanchoe is a succulent praised for its beautiful flowers and Kalanchoe blossfeldiana is the most popular and common species. It can have orange, pink, red, white, or red flowers and some varieties have double flowers. It blooms in winter which makes it even more wanted in every home garden. 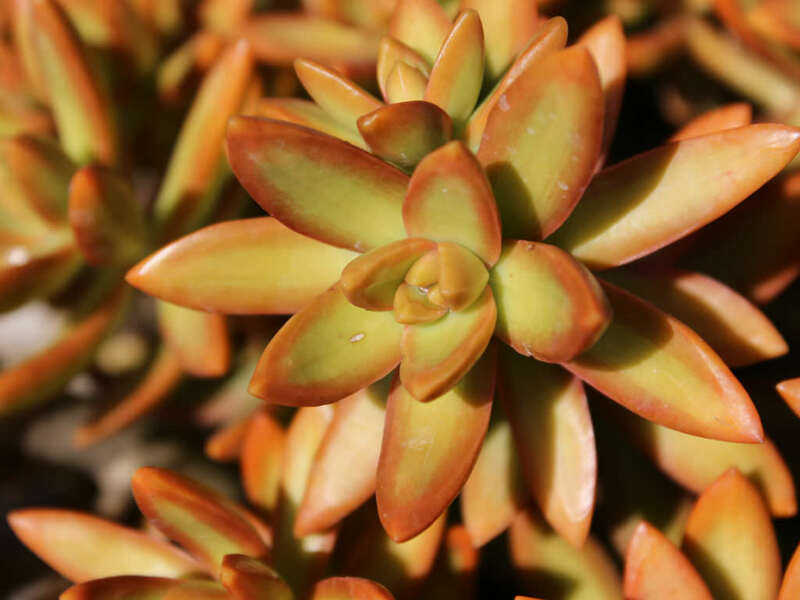 This attractive plant is low-maintenance like any other succulent and will thrive perfectly in full sun with very little water. Be aware that the frost will hurt it. 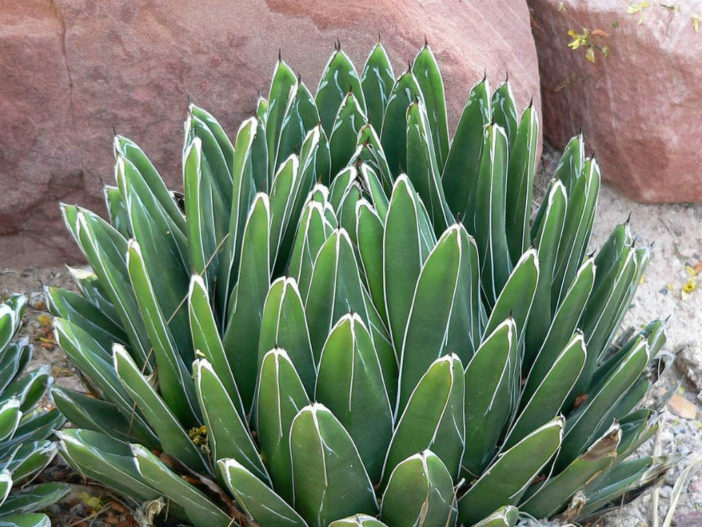 Agaves are native to the Americas. 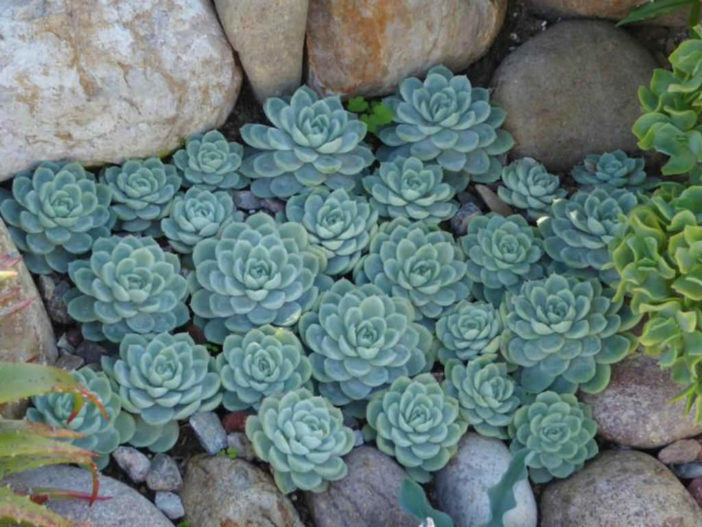 They are one of the most popular succulents due to their rosette shape, drought resistance and low maintenance in general. The blooming happens once as the plant will die afterwards. Agave victoriae-reginae is probably the favorite among Agave species. It grows to the size of a soccer ball over time. Aeoniums are popular succulents because their resemble big, fleshy-petalled daisies and of course they are easy to grow both on your home or in your garden. 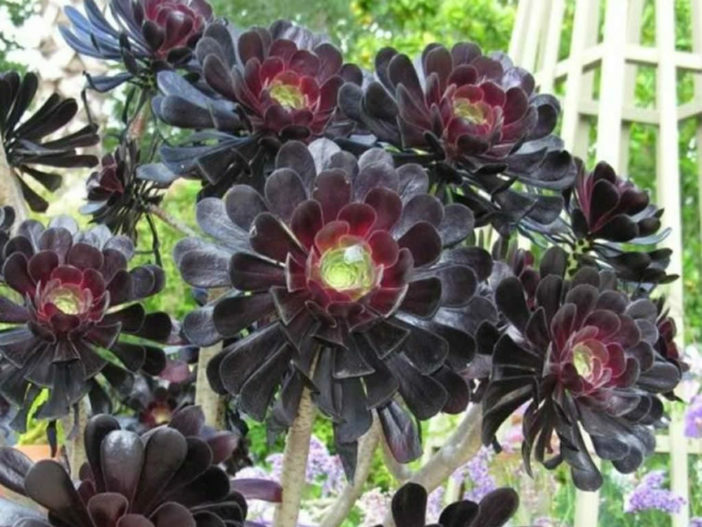 There are many hybrids and species out there but Aeonium arboreum ‘Zwartkop’ is surely a show stopper with its magenta-black. In winter bright yellow flowers contrast with the dark foliage. For best results provide full sun and well-drained soil.